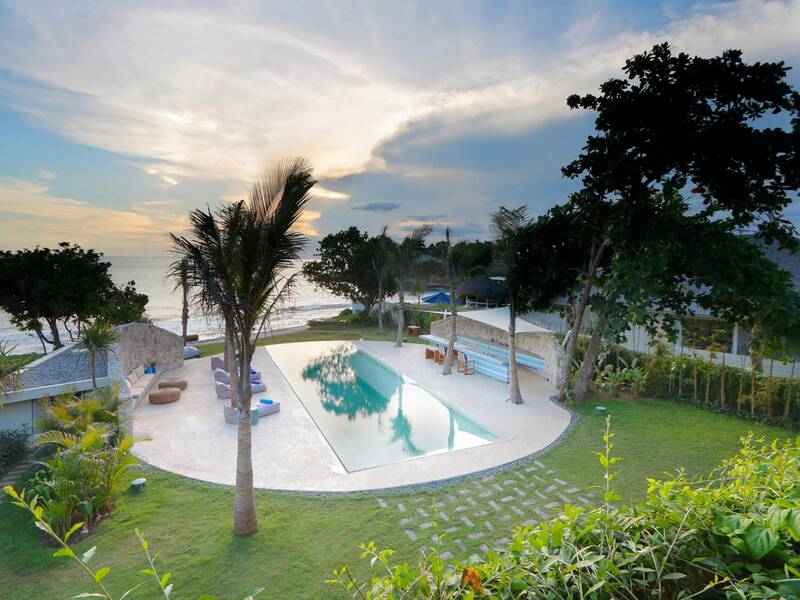 Created as a luxury beach home for couples, groups of friends and extended families, this beautifully designed five-bedroom beachfront villa is set on the crescent of Sandy Bay in Nusa Lembongan, 30-minutes’ boat ride off the east coast of Bali. Completed in 2012, it is unquestionably the finest villa on Lembongan Island. 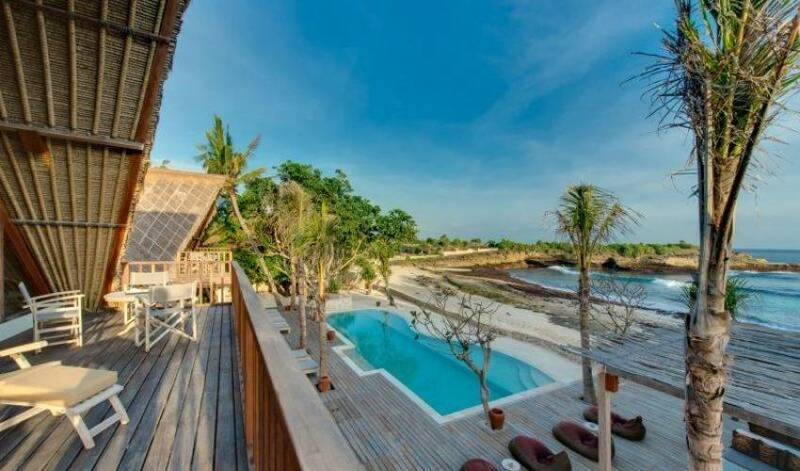 Welcome to a spectacular five-bedroom villa according absolute beachfront luxury in laid-back Nusa Lembongan, off Bali’s eastern coast. 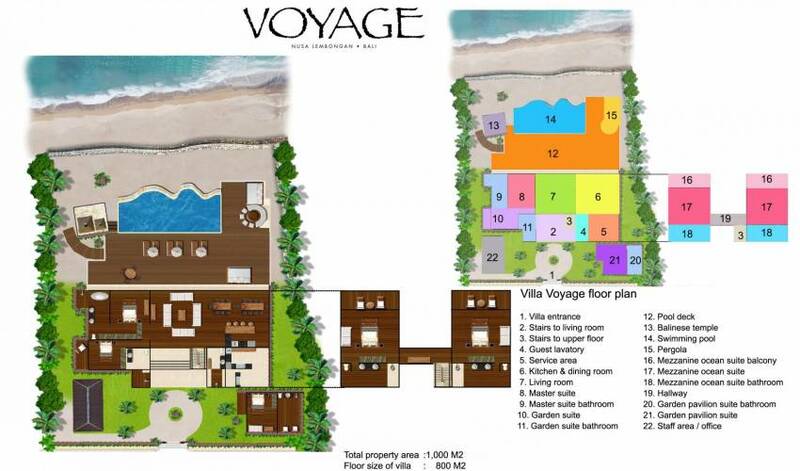 The villa implies a journey, an adventure, an odyssey. It suggests the era of grand sojourns, of cruise ships and safaris, and is the perfect name for a villa whose owner loves to travel the globe: Farah Khan, whose fashion creations are favoured by many Hollywood celebrities, has styled this villa as a barefoot luxury abode, while maintaining the old world charm of coconut-wood floors, bamboo, thatched alang-alang roof and driftwood lamps in a tropical island setting metres from the white-sand beach. There’s a sense of space and freedom in the contemporary interiors, with comfortable sofas and tables crafted from reclaimed limed teakwood set before walls of glass framing the sea view beyond the deck. Accenting the neutral colour palette of creams and greys are couture designer touches and decorative flourishes supporting the glamour travel theme – vintage Louis Vuitton monogram steamer trunks; Prada, Tods, Aigner, and various other designer luggage, and lavishly illustrated coffee table books on exotic destinations, culture, art and architecture. Amplifying the luxury safari look is canvas and leather furniture from the Esprite Nomade collection, including their renowned bespoke tents that float over the villa’s supremely comfortable beds. 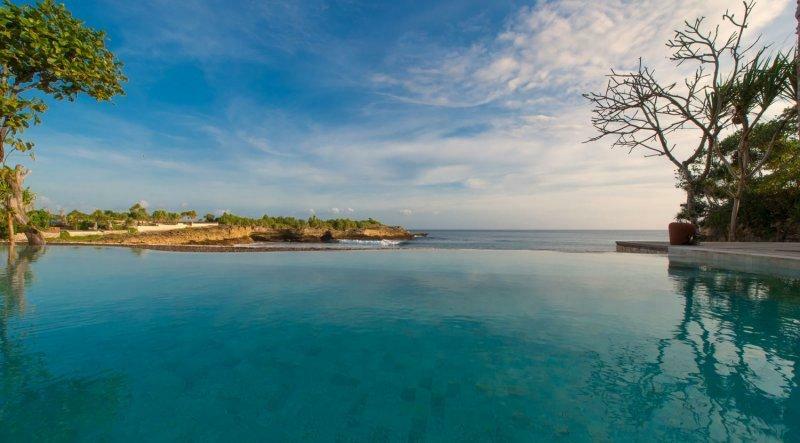 Beyond the villa walls, the place keeps true to its luxury adventure theme. 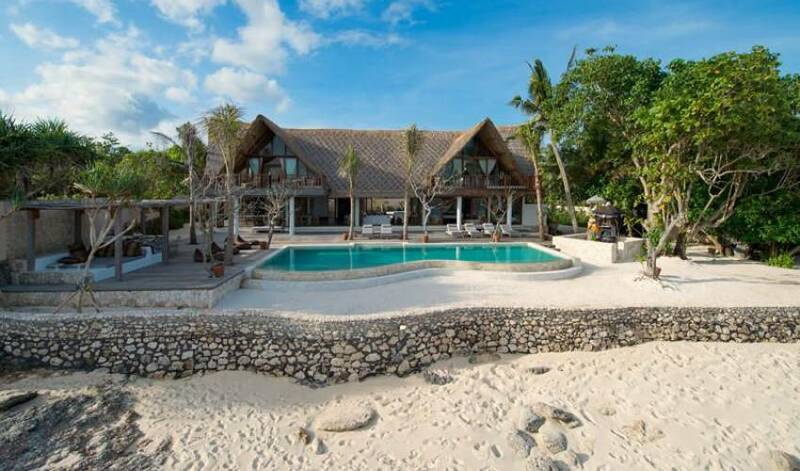 On an island that has few cars, the villa has its own safari-style open-sided buggy for land transfers, and also available to villa guests for island expeditions is the jukung, a traditional outrigger fishing boat that has been transformed into a designer pleasure craft complete with Emilio Pucci print cushions and gourmet picnic baskets. Of course, as in the days of grand travel where one was accompanied by a retinue of helpers, guests can expect to be cosseted by the villa’s charming staff. 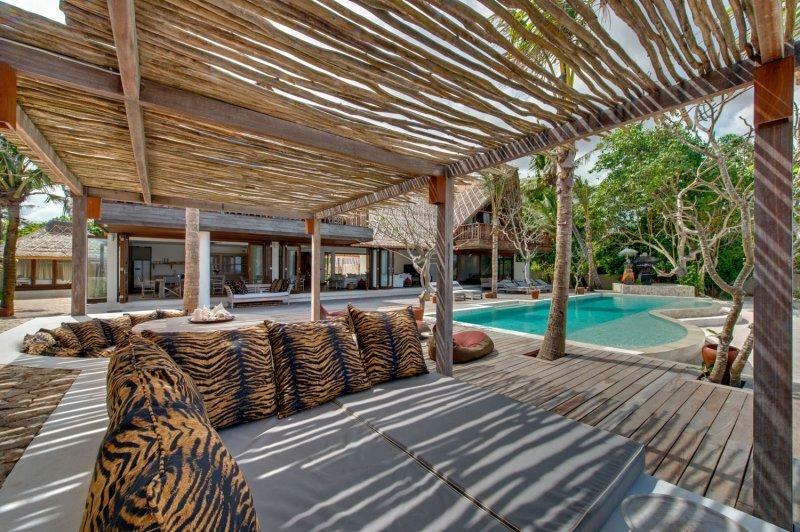 As a designer beach retreat, the villa is incomparable. It is particularly suited to couples, groups of friends and extended families, and will be appreciated by lovers of design aesthetics and effortless chic. The villa is an imposing double-height pavilion oriented along the beachfront to make the most of the magnificent sea vistas – 26 metres of bi-fold and sliding doors open onto a spacious ironwood deck with free-form infinity pool, beyond which turquoise-tipped breakers claim the fine white sand. 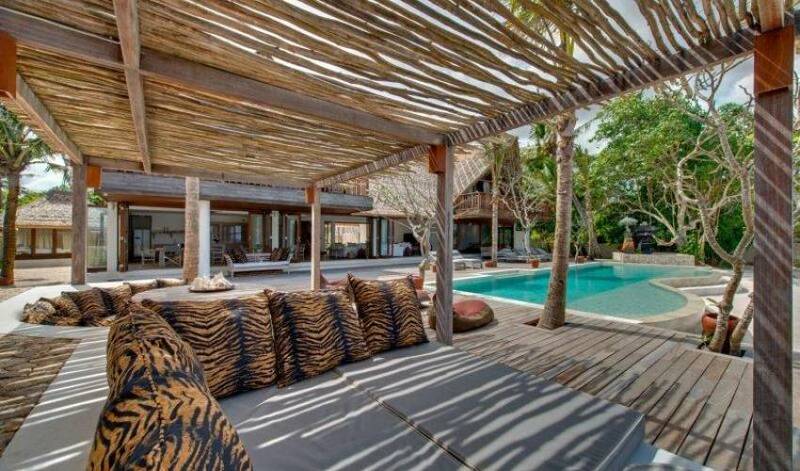 The open-plan living area takes up the lion’s share of the pavilion. At one end is the dining area, bar and guests’ kitchen and, beyond, the chef’s kitchen; at the opposite end is the master bedroom suite and a second bedroom suite. Stairs lead to the mezzanine level where a galleried walkway overlooking the sitting area below leads to the two mezzanine ocean suites at either end. A separate pavilion set in the garden within the villa’s walled compound houses the fifth bedroom suite, and a third discreetly placed building by the villa’s entrance is used as staff quarters. 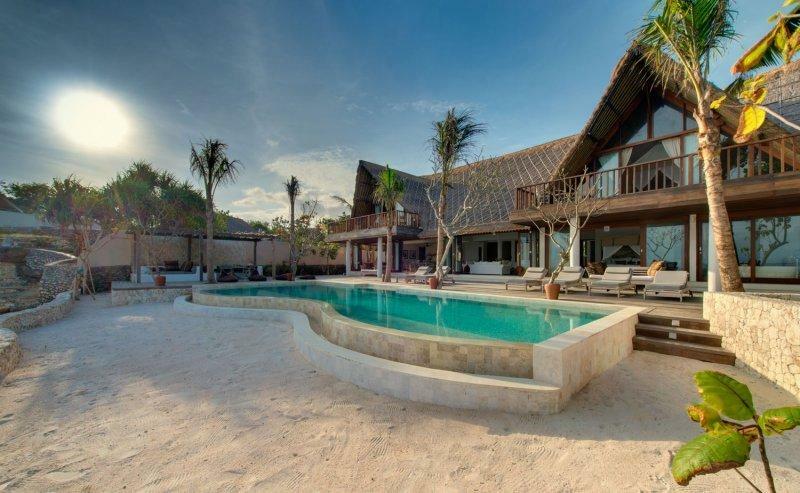 The villa’s magnificent living room is open-plan for easy entertaining, its walls of glass doors leading onto the pool terrace and highlighting the stunning tropical beachfront setting. (The doors fold back completely for open-air sea-breeze living, or can be closed to create air-conditioned comfort.) Within the double-height central section, four over-size cream upholstered sofas are arranged around a sectional coffee table set before a console with 60-inch LED TV, Apple TV, DVD and iPod. The owners’ exquisite taste and design influence is everywhere: Louis Vuitton trunks provide themed displays; Thai, lacquer ware offering bowls provide red accents and richly scented candles tease the senses; lavishly illustrated books on Balinese customs, exotic travel and the best of international interiors engage the mind. Above, a halo of over-size canvas lampshades lures the eye towards the mezzanine gallery – noted designer, Ari Saski Wekku, also created the cigar-shaped driftwood statement lamp over the entrance. On the far side of the living pavilion are two dining tables of reclaimed limed teakwood, each with six canvas director’s chairs. An island of teakwood and marble acts as buffet, bar and cooking station for when guests wish to whip up a gourmet meal themselves. Behind is the chef’s kitchen, equipped with everything required to lavishly entertain 20-plus people. Bridging the pavilion and the beach is an huge ironwood deck overlooking the turquoise waters of Sandy Bay, with a 12m x 5m free-form tension-edge pool big enough for swimming laps yet with a shallow platform for relaxation. Equally evident here is the exquisite attention to design detail found within the villa. Poolside beanbags, sun loungers and daybeds invite indolence, and a shoreline pergola provides shade for two defined areas: an over-size daybed platform inches away from the beach for sea-breeze siestas and sunset cocktails, and semi-circular seating curved around a teak table laden with shells – the perfect spot for a leisurely breakfast. Stylized animal-print cushions add just the right touch of glamour, and at night the area is transformed by clever ambient lighting that illuminates the palms and bathes the pool in changing colours. A few steps down from the deck is a sand garden where offerings are placed daily at a Balinese temple tucked under the canopy of a sacred banang-banang tree; shaded beneath its bowers is an antique daybed and a few paces away a gate set in the low dry-stone boundary wall leads directly onto the beach. The villa’s five spacious bedroom suites are equipped with queen-size beds, ensuite bathrooms and either balconies or garden terraces. King Koil goose down pillows, deep foam mattresses and designer bed linen ensure a good night’s sleep – with rooms offering the choice of air-conditioning or overhead fan. 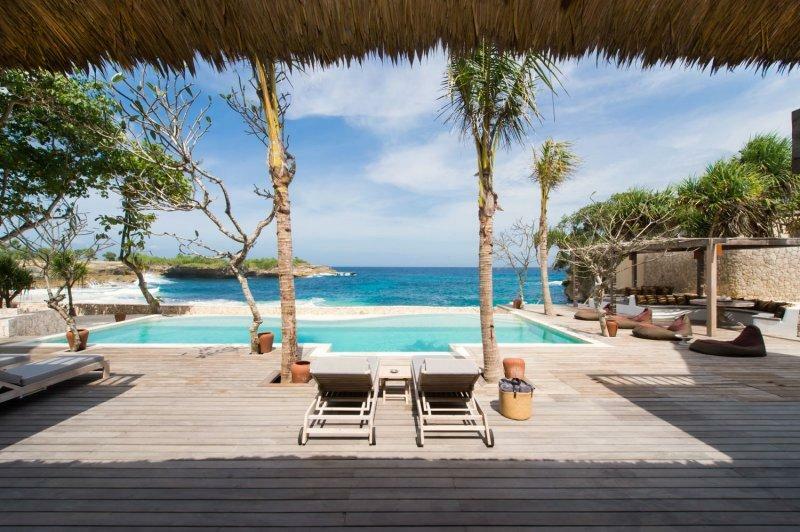 Villa Voyage commands prime position on a small, sandy cove in the south-west corner of Nusa Lembongan; other than Nusa Dua on mainland Bali, from where a string of lights sparkle across the sea at night, the nearest landfall is Australia! 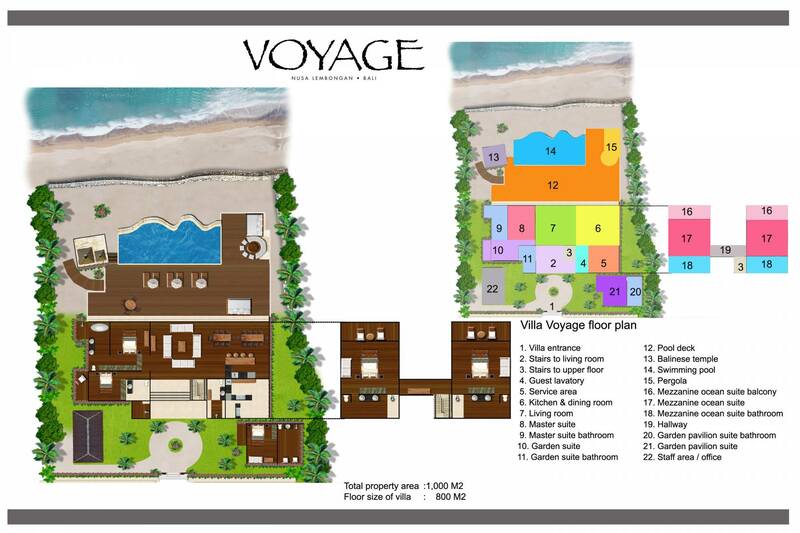 Voyage is part of a small, exclusive community comprising a handful of private villas along the beach and raised on the cliff. 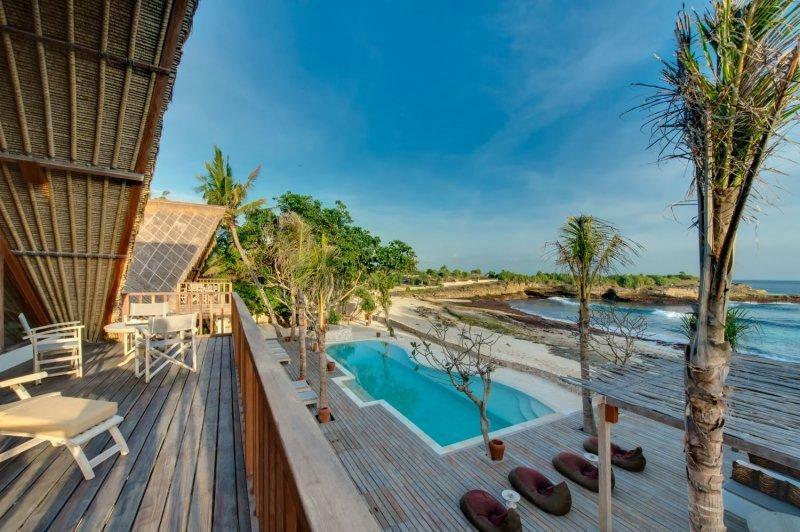 Next door is the Beach Club at Sandy Bay with it’s charming, quiet, beachfront restaurant and brand, new spa, Glo. Across the bay is the spectacular rock formation of Devil’s Tear, scene of crashing waves and plumes of white-tipped foam. 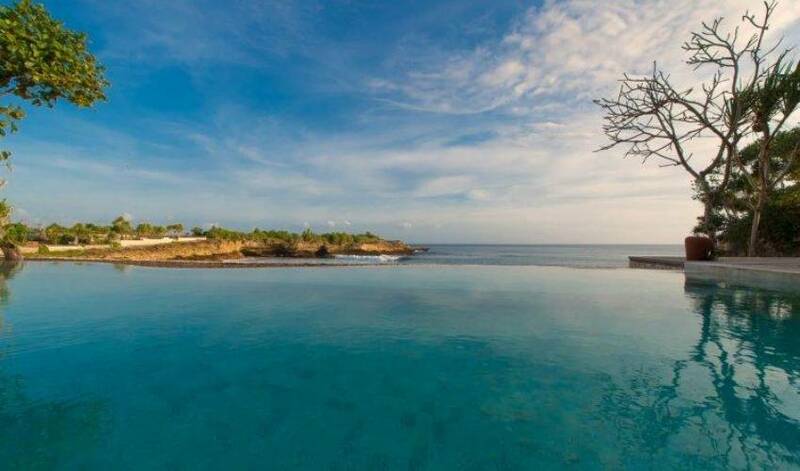 A pleasant ten minute stroll along the cliff-top path – populated by pandan plants and the occasional cow – is Dream Beach with it’s popular café and swimming beach; a fifteen minute walk in the other direction are the restaurants and bars of Mushroom Beach.